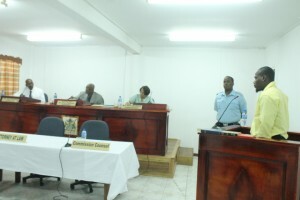 As the first day of the Commission of Inquiry (CoI) into the Camp Street Prison riot commenced on Thursday, one prisoner recounted that six cans of tear gas were lobbed into the building when the fire has started. “About 6 can of tear smoke was thrown into the building…after the tear smoke was thrown into the building it started to burn our eyes and skin so we run to a small ventilated area and we start calling for help, but we haven’t got any response from outside,” Lewis said while under oath. However, before the cans were lobbed into the division, Lewis told the Commissioners that there was an order for the prisoners to come out of the division for a search to be conducted. It was then that the fire was started in the “middle” of the division, the prisoner related. He said that when the prisoners were outside of the yard, the prison wardens used their batons to beat them. Lewis recounted that before the fire started he would have seen one of the prisoners being beaten to an unconscious state. 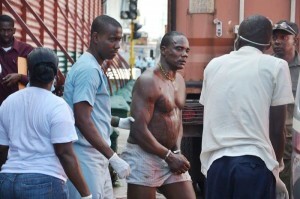 “By the time I run to the front he was already in an unconscious position,” said the prisoner. Going back to when the fire started, Lewis related that he did not know who started the fire; however, he made him way to a room with some amount of ventilation to protect himself. He said that prisoners then began breaking down a wall to escape the flames and possibly get some water to douse the fire. Lewis told the Commissioners that he eventually made his escape through a hole in a wall. 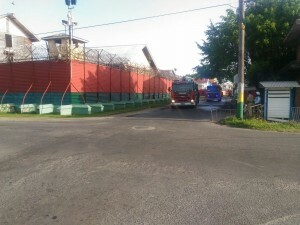 Fire tenders outside the Georgetown Prison Friday morning. He however could not identify who that person was. Lewis also detailed that the prisoners pleaded with the prison officers to open the doors to the facility; however, these pleas fell on deaf ears.